If you’ve read Part One, you might have had a pressing question: Why are AAF files created by Redcine-X Pro? Shouldn’t we be importing them into Avid? Importing AAF imports the metadata present in the MXF file. Importing ALE imports the metadata present in the RMD file. If you’re not going back, i.e., if you’re creating intermediaries for online editing and finishing with the Avid ecosystem, you can import the AAF file. However, if you’re editing proxies and need to go back, then you’ll be happier with the RMD files. Passing around files to various departments in a post facility is also easier when the metadata travels around for reference. Select ‘Merge events with known master clips’ and hit OK. Import your ALE after you have performed this step. Refer to page 1417 of the Avid manual for details. In fact, you should probably download the entire podcast and watch it – it covers all the Avid-Red workflows. Here’s the link. All right, let’s move on. Let’s say you’ve brought over all your transcoded proxies and locked your edit. Now what? How do you go back to your glorious 5K files from Avid Media Composer? Effects, filters and color corrections are pointless in a proxy workflow unless both softwares can understand them 100%. This is rarely the case, even with applications owned by the same company. In the case of Redcine-X Pro, the simplest and only way to bring the project back into the timeline is via EDL. ALE only supports master or sub clips, no sequences. You can export XML via FilmScribe, but it’s tough to get them to work. I won’t be covering XML. In order to create EDLs, you must first launch an application called the EDL Manager. Go to Output > EDL. Click on Get Sequence and load the sequence from your bin (you need to keep Media Composer open). Make sure you select CMX_3600 from the EDL Type. The Source TC and Record TC options are important. The Source TC option assumes you are capturing from tape (that’s EDL for you) so if your Source TC doesn’t seem right (the only way to check is actually go through the generated EDL and test it systematically) you might have to create Tape names (what other softwares call ‘Reel’ sometimes). Record TC reflects the timecode in the sequence. 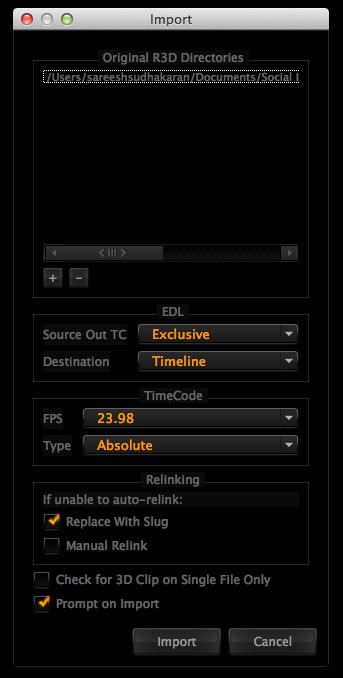 By default the EDL Manager starts at 01:00:00:00, as you can see in the above EDL. You can change that to reflect whatever starting timecode your project desires. Once you are satisfied with the EDL, you can save it by going to File > Save As…. Look under Source Out TC. Inclusive usually means the last frame in a second of video is included in the timecode. Exclusive avoids the last frame. 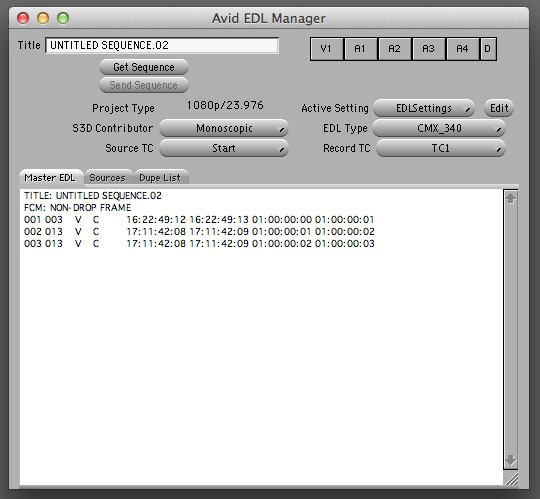 E.g., in a 23.976 (23.98) sequence, the Exclusive EDL only writes the last column (frames) till 23. The 24th starts again at 00. As far as I know, EDL Manager prefers the Exclusive EDL, so select Exclusive under Source Out TC to start out. When in doubt, look at the EDL in a text editor! Destination is set to Timeline, so you can work with the Sequence directly. The TimeCode Type drop down has two options: Absolute and Edge. Both are recorded by the camera, and will be present in the RMD file. Absolute resembles ‘Free run’ where if you’ve shot takes at different times of the day, the ‘gap’ in the timecode takes that into consideration. 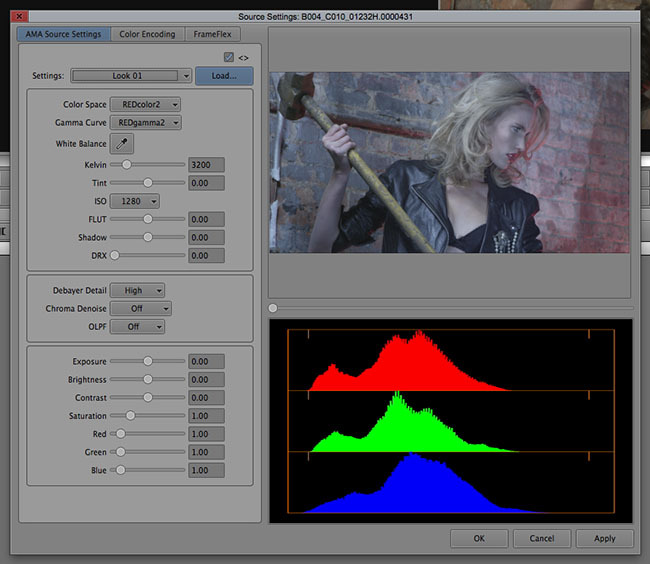 Edge resembles ‘Rec run’ where each subsequent shot carries on from where the last timecode/shot stopped. In the case of sequences, this becomes irrelevant. Under Relinking, make sure to check the Replace With Slug option – because inevitably there will be sequences that won’t load properly. It is better to have a blank slug filling the gap in the timeline so you can link to them manually. Redcine-X Pro sometimes will give you the option to link files automatically. If nothing happens, and you are faced with slugs, you can right click the slug and select Reconnect…. This will throw up a pop that will allow you to find the specific R3D file. Click Import, and hope for the best. Sometimes the way the Avid-Red workflow works is similar to a father-son conversation when the son is a teenager. Assume you are the middleman. It takes a certain kind of individual who will want to go through the process. Why would anyone want to come back to Redcine-X Pro from Avid? First of all, it allows you the opportunity to grade within Red’s software, but more importantly, you can transcode the 5K or high-resolution sequence to DPX or similar format for finishing in another application. If all this sounds crazy, rest assured, it is. It’s not you. It is tough to appreciate the AMA workflow unless you have seen the proxy transcoding workflow. Now that you have survived it, let’s see if the AMA implementation in Avid Media Composer 7 onwards does any better. First, ensure you have the R3D Plug-in downloaded and installed. You might have to restart Avid Media Composer. Somebody has used Redcine-X Pro to create Looks that have been saved in the RMD files. Redcine-X Pro hasn’t been used at all. You have the default choices available, including the latest Color Space and Gamma options (depending on what time of year it is). To load your custom look, click on Load… and select the RMD file. As you can see, Look 01 shows up under Settings. This is Avid Media Composer’s way of dealing with formats greater than 1080p. In the left column, under FrameFlex, if you uncheck ‘Same size as project’s raster dimensions’, Avid will scale down the footage. If you select it, as shown above, you will be able to use a window that matches your project resolution (1920 x 1080 in the above example) to zoom in to it. This is handy for projects that finish in 1080p within Media Composer. Until recently, a large majority of 4K shooters shot 4K because they could crop in closer later. By the time Avid implemented it with the fancy name ‘FrameFlex’, the world moved on to cheap 4K. You transcode (Oh no, not that again)! You buy a powerful computer. You can edit R3D natively via AMA, but many have found it tough going. Playback isn’t accelerated via the Red Rocket card, though transcoding is. If you cannot debayer real-time 5K footage, then editing is almost impossible. Which is why many opt for the transcode option. Sigh. The basic idea is simple. You transcode to DNxHD proxies within Media Composer, and edit with that. When you’re ready to go, relink your clips to their original sources, and export an AAF or EDL and take the sequence to another project. To set the codec and debayer resolution for your proxy, go to Tools > Media Creation > Mixdown & Transcode tab. Under that, you can select the codec for proxies, as well as the R3D Source Quality (Debayer setting). For 1080p projects, leave it at 1/2 Good Quality. Right-click the clip in your bin and select Consolidate/Transcode… and choose the Transcode radio button. Ensure the codec (under Target Video Resolution) is the same one you have selected. The future belongs to the AMA workflow, of course. But, even if on paper it sounds great that you can edit native R3D files, in reality the practice is hindered by what can only be described as the ‘dinosaur-age-way-of-thinking’. It is nowhere as elegant as Adobe Premiere Pro when it comes to native editing of R3D material. Long story short, if you’re on Avid, you’ll most likely be transcoding R3D no matter what workflow you’ve chosen. Whether or not that is acceptable to you, only you can decide. We’ve covered a lot of ground. I hope this short guide has given you enough ideas to get started with an Avid-Red workflow. Tell me how it goes. I am trying to relink mxf proxies I made in your first tutorial back to their original 4k resolutions in Redcine x pro. I create the EDL fine, and follow the instructions on how to import the edl into redcine x pro, however i’m becoming stuck when the system crashes. Can you confirm some details for me? What exactly am I selecting in the “Original R3D Directories” in RCXP? are these each and every single r3d file, or just the folders, or even the volume or harddrive i’m using? At the end of the process, I click import and I have a search box come up. I’ve been assuming I need to select the EDL created, as the only options are for edl, xml etc file types. Then as I hit import, Redcine X pro crashes, and nothing more happens. dfruk Dave, I’m not sure whether you’re following what I had written. I did specifically state that ALE does not relink audio automatically. You need to use the AAF method for AutoSync. I haven’t tested this particular workflow thoroughly, so I really cannot tell you what lies ahead. There are too many variables. Generally speaking, though, I would proceed because you’re finishing at your system. Everything stays on your timeline. If you do have any hiccups you can manually correct a few clips here and there. Chalk it up to the pain of learning. Unfortunately, I’ve already done it the way they recommend against, and I’m wondering if it’s worth redoing all of this before I really dig into the edit. I have already begun autosyncing the .ale-based clips and would have to redo all of that if I want to use Avid’s recommended method. Do you know if these downsides are real, i.e. something I should worry about? We should in 5K HD on the Epic Dragon and I will probably do a 1080p finish in Avid. I’m cutting with DNX 36 files and would master using DNX 175x.